Making it only 6 prims! together with our “Multi Pose Couple System”! (+Cuddles Duo and solo poses/animation). • PG Version: 27 cool poses included with different single and cuddles couple sits animation. • This system makes it very easy to change poses, seat three persons and adjust your position. • 27 cool poses included with different single and cuddles couple sits. • Run couples poses and single poses in the same time. • Colors Lights: you have a large choices of +99 colors for have your sofa in your style. ► Try DEMO at our mainstore, and Discover the complete SFX collection! 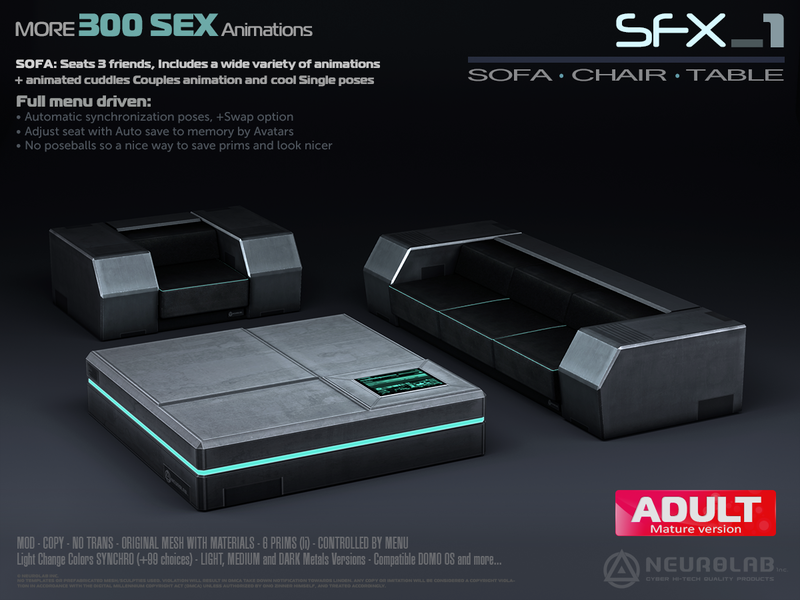 • SOFA Seats 3 friends, Includes a wide variety of animations! • 6 animated Cuddles Couples Poses and 21 cool Single poses. • No ugly poseballs so a nice way to save prims and look nice. • Fully customizable Neons & light colors (more 99 choices or unlimited with DOMO OS Terminal). ► SET COLOR to this product. ► SET COLOR to all products compatible DOMOS OS. ► OWNER-GROUP-ALL : choose who can control. (only owner can change colors!) Perfect for club owner want customize all sofa in club by one click. You can customize the lights also independently or all sofa/chair/table around 100 m.
Perfect for home, All avatars can change colors, also independently or all sofa/chair/table around 100 m.
• Rez to floor. 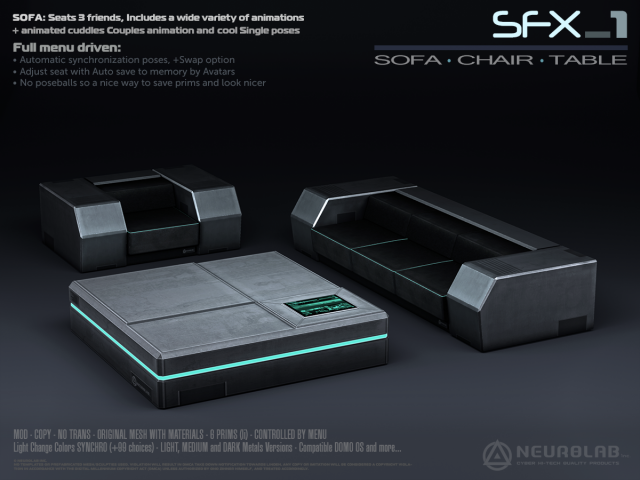 sit on chair or sofa. • click to “more” and choose “color this” or “color all”.